Hafner-Pneumatik is the manufacturer of a complete range of high-quality pneumatic control valves made in Europe. Our products are not only used in the general automation or the machine-building industries, but also in applications throughout the car, truck and process industries. Our customers enjoy the use of our valves because of their outstanding reliability offered at an extraordinary price/value ratio. Our product line consists of solenoid valves, air pilot, manually and mechanically actuated valves, completed by pneumatic control systems. Our wide range of standard products covering sizes from M 5 to G 3/4″ is designed as a modular system, giving us the ability to develop and manufacture customer specific solutions in smaller numbers. As a highly flexible company, we rapidly assimilate technical innovations which allows us to react quickly to the demands of an ever changing market. Hafner-Pneumatik stands for over 30 years of knowledge and venture in the development of pneumatics. Manufacturing excellence, flexibility and customer responsiveness are the dominating elements of our corporate strategy. Foundation of the Hafner Pneumatika Kft. in Mosonmagyaróvár. Cooperation with the German distributor JOYNER pneumatics GmbH. Manufacturing of the former Knorr valves and of a modern pneumatic valve program. The company moves to a new manufacturing facility in Halászi. Hafner Pneumatika starts sales in Hungary. First exhibition on the Industria trade show in Budapest. Foundation of the Hafner-Pneumatik Krämer KG in Stuttgart, managed by Mr. Hafners daughter and Andreas Krämer, her husband. The company becomes part of globalization. The new valve line MD 16 is introduced. Enlargement of the manufacturing plant. Hafner-Pneumatik Krämer KG moves to a larger facility in Kornwestheim. Hafner-Pneumatik presents the products for the first time on the Hannover Fair. Opening of a new building doubling manufacturing space in September 2005. First-time presentation of products for process automation on the ACHEMA trade-show in Frankfurt. Products of Hafner are sold in 23 countries worldwide. Presentation of the valve catalogue edition 2007 on the Hannover Messe. The catalogue contains more than 150 new products. Hafner-Pneumatik and it's distribution partners are present on not less than 8 international trade-shows. The valve catalogue edition 2010 is released. Numerous new products enlarge the range. The highlight: "Hafner on the Rocks" a series of valves for low temperature applications from -50° C to +50° C.
Opening of an additional 800m² manufacturing hall. The quality system at Hafner Pneumatika Kft. is certified ISO 9001. Opening of an 800 m² extention to the 2011 finished manufacturing building. Hafner occupies now a total of 2.770 m². Hafner-Pneumatika Kft. is celebrating 25-year anniversary. By using high quality materials and an approved sealing system, we offer distinct advantages to our customers. spools from stainless steel and the manual overrides from brass. The major advantage of HAFNER's sealing concept is the low friction. There is no deformation of the seal during assemblage of the valve - they are allowed to move independently within the brass cage. Without air pressure there is no contact pressure and, therefore, no friction. This construction also has consequences for the seals of the valves in use. 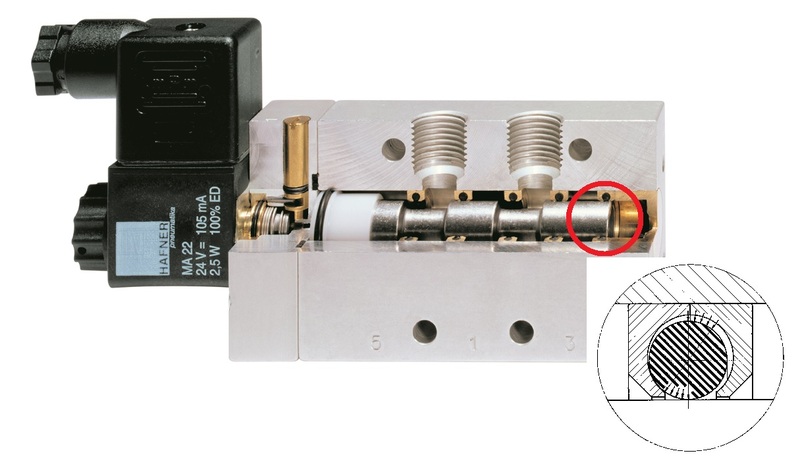 When switching a 5/2 valve, only three of the five seals are exposed to pressure and applying friction to the spool. Even when pressure is high, due to the shape of the cage, there is only the minimal contact pressure applied to the sealing rings which is necessary to seal the valve, as shown in the drawing above. High durability and extended lifetime! High flow combined with compact design! High reliability of the valves! The German-Hungarian team of Hafner work close together to assure 100% customer satisfaction.